Benchmark - a program for testing features and performance of particular HW components, the entire PC or SW. These programs can be divided into two groups: a) application benchmarks (real-world) and b) synthetic benchmarks. Some programs combine application and synthetic tests. Application benchmarks test the behavior of the given system on real-world applications (testing databases and games). Synthetic benchmarks usually do not use any real-world applications and so results of such tests do not always comply with the real world. For example, if the synthetic benchmark evaluates one computer as better than another one, it does not mean that the winner of this test is more suitable for our planned usage. Besides comparing performances, benchmarks are also used for diagnostics (important for revealing defects, weak points, and for planning). Windows System Assessment Tool (Winsat) - A simple tool for the analyses of computer performance (PC with installed Windows Vista or Longhorn). It enables to quickly find out what part of the computer can be causing the slowdown of the system and how the optimization can be executed. This tool can also be used for comparing performances of computers. Even though there exist more precise professional benchmarks, Winsat has certain advantages - it is implemented in Vista and it is officially promoted. The tool is launched upon system installation or later from the Vista system. Subscore - evaluates particular HW components and is intended to be used for upgrading (evaluating) particular components. A range from 1.0 to 5.9 is used. The higher score, the better. 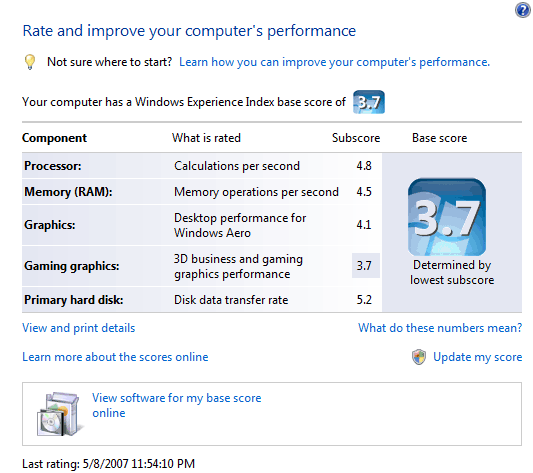 Base score * Windows Experience Index (WEI) * - Your system's total score is determined by the subscore of the weakest component of the system. Which means: if you have a powerful computer, but your graphic card is of poor quality, your system may be scored as 1.0, which is the worst of the worst. You can gain higher score by upgrading the weakest component. In our case (pic), exchanging the graphic card we could gain score up to 4.5 (if the new graphic card achieved better score than RAM with 4.5). The values may not necessarily be precise comparing to professional benchmarks, however, they are ideal for quick and simple approximate evaluation of the computer performance. The results may be influenced by running programs, and can also change, depending on the new drivers and other HW / SW changes in the computer. Besides their information value, the results also have impact on usage of some parts of the system, they automatically optimize the usage of some system components. For example, if the graphic card was evaluated as weak, the AERO graphic interface cannot be used and slow external USB devices cannot be used for Readyboost. In the future, the results gained from Winsat will help users to decide what HW and SW to buy. 1.0 - Minimum for Windows Vista (Windows Capable PC / entry-level). The AERO graphic interface cannot be used, as well as games and application = only for Internet and office use. 2.0 - Higher minimum with the option of using the AERO graphic interface. Problems can appear when running multiple applications at the same time or when playing more demanding games, applications and multimedia. 3.0 - Mainstream value / low-end - A PC meeting the requirements of Windows Premium with graphic card supporting Directx 9.0 and higher. This is intended for multimedia, with possible usage of Windows Media Center. If using two monitors (or monitors with high resolution) in combination with AERO, delays in displaying graphic elements can appear. Some more demanding programs and games can be used. 4.0 - PCs of mainstream and high-end performance of 2006/2007, with the option of using demanding applications and games. Windows Media Center enables smooth playing and recording of HD video. 5.0 - PC for demanding usage and for Windows Vista without any limitations. It meets the requirements for video processing, graphics and games needing high PC performance. 6.0 and higher - Future - Every 12-18 months the range should extend according to the actual HW progress. So in 2008, the scale will probably be in the range from 1.0 to 8.0. The current evaluation will not be changed, only the scale will be extended for new components (e.g. from 6.0 to 8.0). For example, if you exchange the graphic card having the score of 8.0 and your processor having the score of 5.0 was the weakest component of the PC, your evaluation will remain 5.0. Only the scale boundaries for the average will extend. Microsoft assumes that the SW manufactures will state the recommended and minimum evaluation for particular applications. Users with less experience will have to know their HW precisely, however, the WEI number should do (this number can be found in the system or can be gained when buying a new computer). For the time being, this option is only utilized by games that are part of Windows Vista (Start - All Programs - Games - Game Explorer). A similar picture should appear on boxes of new games and should theoretically replace the need of knowing the computer configuration. The winsat.exe file (Windows\system32\winsat.exe) can be also copied in Windows XP, unfortunately, it can only be used with certain limits. (not for Windows XP) - executes full test. For testing the RAM access time rate. The next criteria is the RAM size - <256 MB (1.0) <500 MB (2.0) ≤512 MB (2.9) <704 MB (3.5) <960 MB (3.9) <1.5 GB (4.5). Non-standard sizes (cannot be multiplied by 256MB) can be caused by shared memory for the graphic card. For testing the performance of the disk on which Windows Vista is installed. Disk with the score of 3.0 and higher is recommended. Graphics - determines suitability for AERO and playing video. Evaluation is influenced by memory throughput and the memory size of the card. Gaming Graphics - determines suitability for games. Evaluation is influenced by FPS test and by the features the card supports D3D 9, DX 9, WDDM and Pixel Shader 3.0. 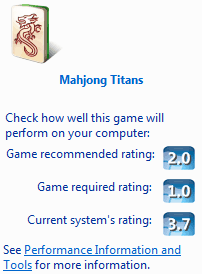 If the card is of high performance but the above stated features are missing, it can gain the score of 1.0.